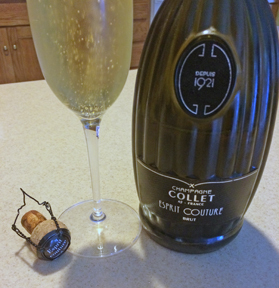 Champagne Collet Esprit Couture enjoyed on our 46th wedding anniversary. By the end of the day we were too tired to go out for dinner. Taking family to the airport, we stopped to do a bit of shopping before returning home. Fortunately, I placed a bottle of Champagne Collet Esprit Couture in the refrigerator prior to our sojourn. I am a firm believer that sparkling wines are an everyday wine. However, when it comes to champagne, given the near $100 price, I see this wonderful sparkling wine as a celebratory wine. We spent the early evening of our 46th wedding anniversary enjoying an Esprit Couture Brut.